The two Chinese zodiac signs of the dragon and horse can have a lot of fun together. They will be energetic and stimulating together. They will connect on both the social and intellectual levels. Both the dragons and horses are full of energy and love to have fun. They both prefer not to put down roots. They can keep each other challenged, happy, and satisfied. The two Chinese zodiac signs of the dragon and horse have quite a bit in common. The both love to have a good time and are daring and sociable. Both will prefer moving about and staying busy. They will enjoy getting out of the house more. The Dragon and Horse relationship will be happy if they can keep a job and keep their home running well. They will be strong together when they both have the change and independence they require. They will encourage each other’s enterprising nature. The dragon and horse friendship will be popular and fast moving. Both these animal signs will draw each other in with their sensual nature. They will likely be attracted to each other immediately. Even in bed, they will complement each other sexually but not always. The dragon man and horse woman will spend time together due to their close bond and their love of an energetic social life. The dragon woman and the horse man will share a lot of friends. Both will enjoy getting out of the house and doing something different and fun. Their friends might be jealous of their excellent love compatibility. The dragon and horse in love have a lot of energy, a good sense of humor, and are very smart and appealing. The female dragon is kind hearted and has a lot of strength and might think the male horse is self assured. However, he has somewhat of an inferiority complex. The female horse is more restless than the male dragon. They appreciate and respect the dragon’s intensity and enthusiasm. They tend to be somewhat frugal. When the dragon is dating a horse, this might create issues and lead to a Dragon Horse breakup. The dragon enjoys the horse’s loving nature and strength. They will be good at bringing money in. They are often excited about starting new projects. They have an intense persuasion because of which they will not be as annoyed with the horse’s fickle nature. The horse will be practical about any decision the dragon horse soulmates are making together. The dragon and horse marriage compatibility too can be very good as long as they can learn to accept each other. 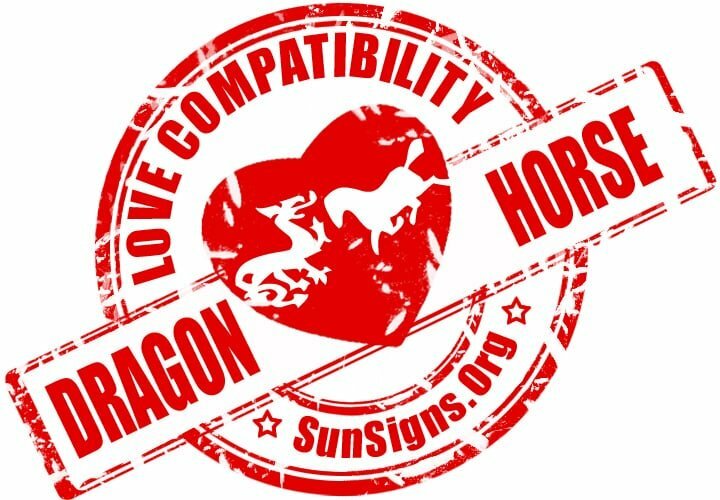 Dragon & Horse Chinese Horoscope Compatibility Rated 3 Hearts!